As we move into the month of February, Chinese New Year is around the corner, taking place on February 19th, 2015. In Chinese culture, each year is associated with one of the 12 Zodiac animals as well as an elemental energy (Fire, Earth, Metal, Wood, Water). 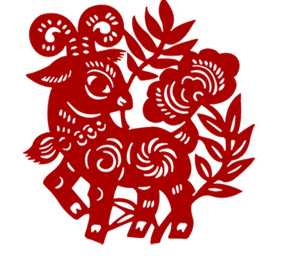 2015 is the year of the Yin Wood Sheep, and it follows the year of the Yang Wood Horse. Wood energy is all about upward and outward expansive growth, like shoots sprouting up from the ground or trees leafing out in the spring. It is generally aligned with action and empowerment. The Sheep, however, is a much gentler animal than the Horse, who brought a great deal of movement and at times chaos in 2014. Of importance this year is intimacy, family, and close relationships. Other important themes for 2015 are acceptance, expression and creativity. The Sheep is a symbol of peace, harmonious co-existence, tranquility, and the arts. Symbolic foods are often eaten on New Years in China. These include tangerines and oranges, which are said to bring good luck, whole fish, which symbolize abundance, and desserts, which bring a sweet life in the new year. There are similar culinary traditions in the U.S., including “Hoppin’ John,” which is a dish of black eyed peas and greens served in the South on New Years Day for good luck. New Years is a great time to set forth intentions and hopes for the coming year, and ground those intentions in a symbolic gesture like a shared meal. If you haven’t already considered goals and intentions for 2015, the Chinese New Year is a great time to express those aims, and to celebrate life. Also around the corner is the beginning of Spring! Springtime actually begins February 3rdby the Chinese calendar, and the equinox represents the height of spring. It might still feel like winter, but the seed of spring has been planted and is beginning to germinate. We may notice the crocuses coming up, and a sense of preparation in nature for the rapid growth and blossoming of springtime. Now is a great time to receive regular acupuncture to prepare your body for the seasonal shift, and protect against colds and flus that often accompany climatic changes. I’ll talk more in March about helpful dietary and lifestyle habits for spring.